Your age has a direct effect on what you are taught in history class. If you were in school during the Vietnam War, chances are you weren’t being taught anything about it (save for a current event discussion or two.) If you attended school immediately following World War II, curriculum didn’t include a section on internment camps. But these gaps, in theory, should be closed by life experience. Home life, including television, and adult learning (in any form) should eventually create a seamless sense of American history. Whether unique or not (my personal) recent experience would dispute this scenario. Conversations prompted by the 50th anniversary of The March on Washington have revealed startling ignorance of (relatively) recent American history. My (utterly unscientific) sample included people in every decade from 20s – 70s. It would be a safe assumption that those people in their late 40s to early 50s might not have a full understanding of the history of the civil rights movement. The March, which many would identify as the fulcrum of the movement, happened before their arrival or shortly thereafter. But that particular (non-random, self-selecting) sample was not lacking in information. It was the younger people who seemed to have no knowledge beyond there having been a speech. What led to the March, the climate at the time, the danger, the heroism, and the cast of characters were all news to them. Even those at the anniversary celebration on the National Mall (presumably having an interest in the subject) did not appreciate the significance of the ringing of the bell salvaged from the Birmingham 16th Street Baptist Church. Going beyond the 1963 March and the people who brought it to life, are the politics that preceded and proceeded. The significance of speakers; Lynda Bird Johnson Robb and Caroline Kennedy was lost on those in their 20s and 30s. More than once I dutifully explained the civil rights legislation that was crafted and signed by their respective fathers. 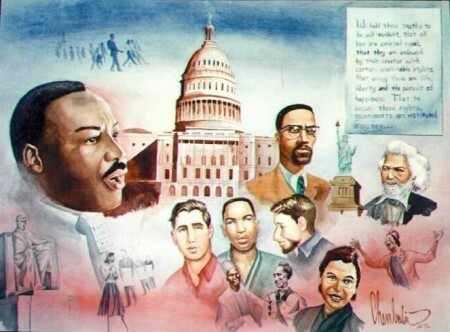 It is hard to fathom how the details of the civil rights movement and all that happened in the 1960s could not be a major part of K-12 American history. History, like most subjects, builds on prior knowledge. Without covering the civil rights movement how does one teach women’s rights, union/migrant workers’ rights and the LGBT movement? How does one cover international civil rights and racial/ethnic issues without discussing our own domestic fight? I’ve actually no doubt that the civil rights movement is comprehensively covered in many (if not most) schools across the nation. I suspect that the reason for those blank stares and awkward silences I received was due to the time period in which the students were taught. Learning about the 1960s in the 1980s or 1990s must have seemed abstract. Growing up in a Reagan, “greed is good”, post-affirmative action, post-Title IX world, would make the black and white imagery seem archaic and less relatable. But the thing is, it’s not an abstraction. A lack of understanding about the fight (that has not yet been won) is dangerous. If we aren’t conscious we can let too many things slide. When we see things out of context we are more willing to wave our hand and dismiss bigotry or racism. When we don’t know about the Voting Rights Act we might not notice it slipping away. What we learned in school (whether in the classroom or out) will always shape us to some degree. But that learning and understanding should just be the start of understanding our world. We need to know what came before to appreciate how best to go forward. It is worth mention that my random unscientific sample included people of varying ethnicity and race. The lack of knowledge/understanding was equally distributed. A woman standing behind me (at the 50th anniversary) referred to Dr. Martin Luther King Jr.’s infamous speech as ending the KKK and white supremacy. Part of me wanted to live in her world, but the other part of me wanted to forcibly open her eyes.